CDW (NASDAQ:CDW) , a leading provider of technology solutions to business, government, education and healthcare, launched the latest phase of its “People Who Get IT” integrated brand campaign to coincide with the NCAA basketball tournament. 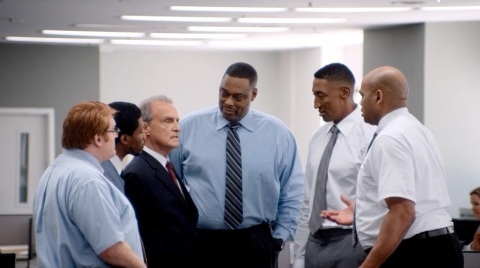 This time around, fictional company Gordon & Taylor outperforms the competition with help from basketball greats Scottie Pippen and Rick Mahorn, in addition to campaign mainstay Charles Barkley. Since Barkley joined Gordon & Taylor, the company has won at basketball, won new business by losing at golf, won on the road with its mobile office, won despite having a football stadium without a team and continued to grow smartly along the way. But keeping pace with rapid technology innovation can be difficult – unless you have a winning team behind you. That’s where CDW comes in. Its team of professionals assists organizations with a deep bench of IT experts to help create competitive advantage. The campaign showcases CDW’s expertise in cloud computing, mobility and data center solutions. Just as Barkley helps Gordon & Taylor win with the support of his teammates, leading IT solutions from CDW and its partners help customers grow and succeed. Partner solutions from APC, HP, Intel, Lenovo and VMware are featured, along with the CDW capabilities that power them. Barkley has anchored the serial “People Who Get IT” campaign since March 2012, engaging CDW’s audiences in a memorable way to effectively deliver simple, clear messages that resonate with IT professionals and business leaders alike. Ogilvy & Mather Chicago worked with CDW to develop the campaign. Spots will appear on national television and radio, in print and online throughout March Madness. The ads, directed by award-winning and Hall of Fame television commercial director Joe Pytka, will run during the NCAA March Madness broadcasts on CBS and the CBS College Sports Network (CSTV). In addition, radio spots will run on ESPN- and Westwood One-affiliated stations. The print and digital elements of the integrated campaign will feature a new and evolved look and feel. To access the campaign materials, visit CDW.com/PeopleWhoGetIT. To learn more about CDW, visit CDWCorp on Twitter, CDW Corporation on Facebook, CDW on LinkedIn and CDW on Spiceworks. CDW is a leading provider of technology solutions to business, government, education and healthcare. A Fortune 500 company, CDW was founded in 1984 and employs approximately 7,200 coworkers. For the year ended December 31, 2014, the company generated net sales of more than $12.0 billion. For more information, visit www.CDW.com.